‘Tis the season to be naughty. When Diane returned to Venice to attend the Christmas masked ball, she was shocked and thrilled to see Domenico Coducci, the husband she’d thought dead, still alive and as magnificent as ever. But Diane needs to know that Domenico still holds her in his heart before she can take her place in his bed again! 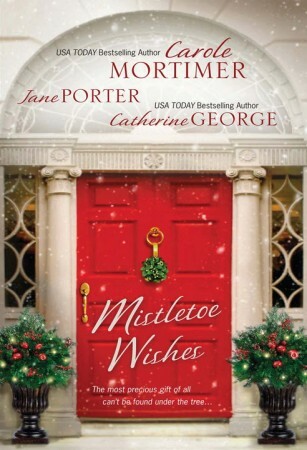 Also includes novellas from Carole Mortimer and Catherine George. What was she doing here? How could she possibly have thought this was a good idea? Diane Mayer hovered inside the opulent ballroom of fifteen century Ca’ Coducci, one of Venice’s beloved jewels on the Grand Canal, thinking she’d made a huge mistake coming to the masquerade ball hosted by the noble Coducci family in their palazzo tonight. Tickets were costly to the gala fundraiser but a friend had passed his on to her and since she was already in Venice for business she decided at the last minute to come. But she shouldn’t have. She wasn’t ready for this. Wasn’t strong enough yet. This used to be her home. Her family. But five years ago she’d lost it all in the blink of an eye. That’s all it’d been. The blink of an eye. Domenico had taken his eyes off the road for a moment, just long enough to turn, look at her, smile, and then they’d been blinded by light before that horrific bone shattering impact that had crushed their car to bits. Sucking in a nervous breath, Diane adjusted her white Shepherdess mask as costumed guests swirled past. Goddesses and nymphs, satyrs and maidens, unicorns, angels, and even fairy tale characters laughed and danced through the doorway into the vast ballroom, a room lit entirely by candle light. Fat ivory tapers glowed in scones and smaller candles in glass votives on the floor while the ballroom’s gold ceiling, distinguished by three enormous glass chandeliers, glittered and shone, casting golden light on the fantastical masks and costumes below. And no couple was more fantastic than the winged lion and golden Venus slowly circling the room. Diane, who rarely noticed people, who loved art and architecture more than society, stared, fascinated. Enthralled. How beautiful the two of them were together. They were a stunning pair, perfectly matched, gilded by the candlelight. Venus’ mask barely concealed her exquisite face, but it was he, the winged lion, the symbol of St. Mark, Venice’s patron saint, that captivated her. He was a work of art in the softest golden leather pants which had been fitted to powerful legs. A red and gold robe fell from his broad shoulders leaving his muscular chest and hard, flat carved torso tantalizingly bare. His arms were thickly muscled and bare, too, while his face was hidden by a gold lion mask that nearly covered his face completely, beginning at the brow, extending over his nose, skirting his upper lip but then dipping low to follow his jaw. A thick gold mane covered his hair and wings—enormous gold wings sprung from his back as if he were an arch angel about to take flight. It was more than a costume. It was a fantasy. He was man and beast. Fierce. Regal. Seductive. Lethal. Diane’s throat closed and her heart ached. For a heartbreaking moment she thought of Domenico even as the candle light illuminated him, shadowing his face, and outlining his size. He was tall, even taller than Domenico and broader through the shoulders, and yet he made her long for the life she’d lost. Love, pleasure, possession. God, it’d been years since she’d been with anyone, years since she’d been touched, loved, held. Hadn’t wanted to be touched, held, but this beautiful impossible fantasy made her crave and hunger and dream. Maybe someday. Maybe one day. If she was lucky. And then the mythic winged lion turned his head, thick gold mane brushing his shoulders, to look her way, to look at her, and her heart skittered to a stop. So like Dom. Those eyes. That expression. Her heart squeezed even tighter, and her head spun and she leaned on her shepherdess staff, her bad leg about to collapse. So much of him reminded her of Domenico. The height, the shape of his broad chest, the muscular, tapering torso, the narrow hips above long strong legs. It was almost as if the Coducci palazzo was playing tricks on her imagination. Ghost, angel, beast. It’s not Dom, she told herself. Can’t be. Domenico’s dead. And yet this beautiful winged lion, this symbol of the city, looked at her as if he could see beneath her mask, beneath her costume. He looked as if he could see straight through her. Right to her heart. Her hand trembled violently on the staff. The winged lion was approaching.